Nthabeleng Likotsi is on course to establish the first black women-owned bank in South Africa. Her aim is for the bank to empower black female entrepreneurs with the financial support they lack. "I asked myself what it meant to be a young black woman in South Africa. Truth is that not much is happening for black women." On the formation of YWBN, Likotsi said, "I asked myself what it meant to be a black young woman in South Africa. And the truth of the matter was that not much is happening for black women," she said. This gives an insight into Likotsi's overarching goal: to create black wealth. She realised that this could only be achieved through a bank that understood and was dedicated to a black entrepreneurial clientele. This led to the formation of a YWBN cooperative financial institution, which currently has 420 shareholders from age 16 to 75 and has collectively generated R4,2 million in investment. In the past year, and as the chairperson of the YWBN Co-operative Bank, Likotsi has furthered the cause by working to meet South African Reserve Bank requirements in order to propel YWBN from being a cooperative to a mutual bank. On Friday, 15 June 2018, she and veterans of the 1956 Women's March trooped from the Union Buildings to the South African Reserve Bank to submit their application. "There is a lot of preparation that goes into getting a licence to run a mutual bank. The requirement is that you should have between R10 million to R15 million, just for the application - excluding the capital expenditure and operational costs, among others," she said. "Our theme is built around the women of 1956, who fought for political freedom. We can't expect them to still fight for us. They are handing over the baton to us, the younger generation." She also stated that she is confident that the YWBN Mutual Bank will be fully operational in 2019. "There is no space for negativity. We will not fail." Stokvels are about "the power of a collective". This collective comes together to pool money for a common aim, thus mobilising like-minded individuals towards achieving financial and social goals. Historically these short-term to medium-term goals included debt repayment (43%), emergency savings (44%), education (25%), groceries (31%), clothing (18%) and other (16%), according to the 2017 Old Mutual Savings and Investment Monitor. Born in Botshabelo, Free State province into a family of businesspeople, Likotsi gained her leadership and community service capabilities from her parents and siblings. This spirit is what bolstered her as she shunned a career in accounting to venture into business and change the country's economic outlook. 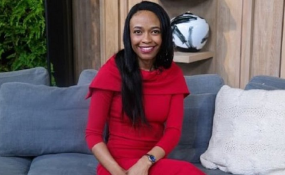 She has a Master's Degree in Entrepreneurship from Wits Business School, a post-graduate Certificate in Accounting from the University of Johannesburg, and a Certificate in Entrepreneurship from the Centre of Entrepreneurship at Wits Business School.